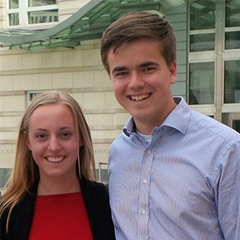 Jonas Tylewski and Hedda Nielsen, hailing from Germany and Sweden respectively, first met while participating in the Benjamin Franklin Transatlantic Fellows (BFTF) Initiative: Summer Institute for Youth in 2011. The two were so inspired by their experience in the United States that they decided to create their own program for other young leaders in Europe, using BFTF as a model. As Jonas has stated, his time in the U.S. “encouraged me to actively involve, to care, and to commit to society to repay the chances I already had in my short life.” The program Jonas and Hedda developed, “Global-In Fellowship (GIF),” is a three week international youth project which provides participants with an opportunity to develop a commitment to international cooperation, and to enhance diplomatic and leadership skills. Since the program’s founding in 2013, the Global-In Fellowship program has reached 150 youth from more than 15 different countries in the EU, as well as from Morocco and Jordan. The most recent program, held in Berlin, Germany in July 2015, brought together a group of 16-20 year olds from twelve different countries: Bosnia and Herzegovina, Croatia, Czech Republic, France, Germany, Greece, Jordan, Luxembourg, Morocco, Norway, Poland, and Sweden. GIF consists of BFTF elements, a ModelUN, and a post-world war simulation. The simulation exercise encourages participants to envision a world in which only a few states remain intact and the political infrastructure has been wiped out. The participants must therefore create a new framework of world order and rebuild the ideal political systems in their countries as well as an international organization. GIF has been supported with funding from the U.S. Embassies in Germany and Sweden, the U.S. Department of State in Washington, D.C., and the EU Erasmus+ program. The Global-In Fellowship is a testament to how alumni of U.S. government-sponsored exchange programs can work across borders to develop programs which inspire future generations of young people and train the next cohort of international diplomats and leaders. Learn more about the Global-In Fellowship through its website or connect with the program on Facebook.